Wow, that looks friggin amazing! Mike did a great job, as always. Things are about to take a turn for the (even more) bizarre, aren't they? -->> O YEEEEEEEH BABY !! Daffy Duck Donatello :: "HA HA! GUARD! TURN! PARRY! DODGE! SPIN! HA! THRUST!" ** WHAAAPPPP ** ** "
Great cover, though as Ian said, I'm wondering where it's leading...! Where are his green tights and pointy shoes? Looks great. Mike's covers are some of my favorite. Along with great artistic style his compositions are always so cinematic. Who pencilled the image? The turtle looks Dooney, but the hand in the FG looks like a Lawson hand...? Alex "Toon" Deligiannis, Jim Lawson doing the pencil version at first, then Mike Dooney made a painted version of the cover. Can't wait for TMNT #31! Little Don of Staffwood Forest! Demon-Alukard, thanks! I know Jim usually pencils before Dooney does his thing; I was just asking because the turtle doesn't look like Jim's normal stuff. I see in that link that it was in fact Jim's, with Dooney switching it up a bit. Thanks for the link! Alex "Toon" Deligiannis, you're welcome! While Mike and Jim have been have seemingly ( and most famously been working in tandem ) on the TMNT v.4 covers ..
they have been working together a bit since the early 1990s. The prestige format from Archie of TMNT II - Comic adaptation , the cover shows one of their earliest collaborations i can recall. Make it "Ivantello" and it almost works. Gad, "Ivanhoe" was probably the most boring book I've ever read, next to "Pilgrim's Progress". 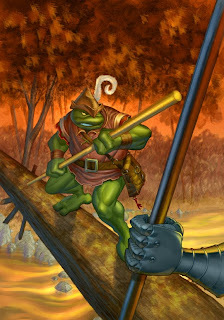 Just to be clear, Jim pencils all of the TMNT covers and I do color rendering based on those. I honestly make an effort not to change too much of what Jim has put down. Since our drawing styles are so different though, I often need to bend the rules of reality here and there so I can make things work for my brain. LOL I was thinking the exact same thing tOkKa! All they need is a little Frier Porky in the background.